Ardbeg Distillery announces the eagerly-anticipated release of Galileo, a limited edition 12 Years Old Islay Single Malt Whisky – a celebration of its pioneering space maturation experiment. 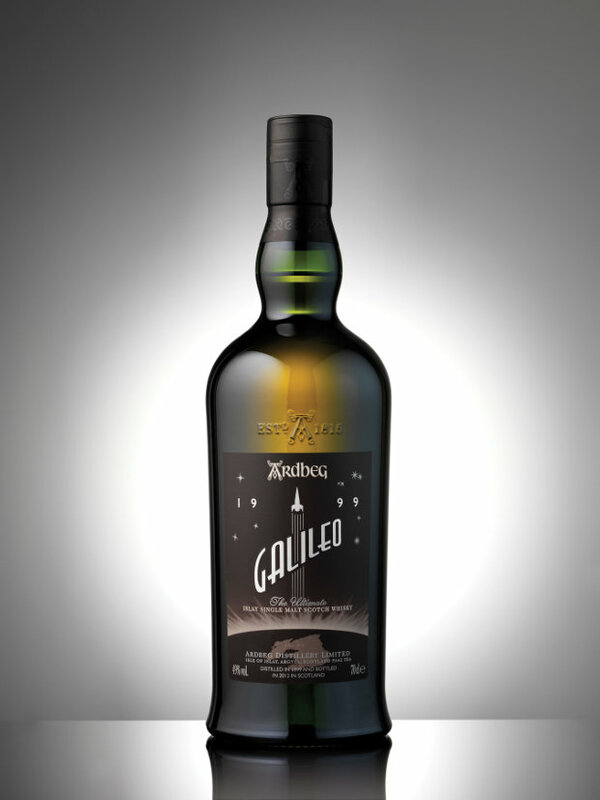 Bottled at 49% and non-chill filtered, Galileo is a vatting of different styles of Ardbeg laid down in 1999, married together to give a sweet, smoky texture. In addition to the traditional first- and second-fill ex-Bourbon casks used for the maturation of Ardbeg, some ex-Marsala wine casks (from Sicily) have been used for Galileo. The ex-Marsala casks contribute further fruity aromas and textures to Ardbeg’s renowned peaty smokiness. The whisky, named after the father of modern astronomy, celebrates a two-year experiment to test micro-organic compounds drawn from the distillery’s production on Islay: US space research company NanoRacks LLC invited Ardbeg to take part in a maturation experiment between normal gravity on Earth and micro-gravity which is taking place in the International Space Station. Vials launched by Soyuz rocket from Baikonur in Kazakhstan in late 2011 contain a class of compounds known as ‘terpenes’. The experiment could explain the workings of these large, complex molecules as they will remain on the International Space Station for at least two years. Working in close collaboration with the Ardbeg Distillery team in Scotland, NanoRacks will closely monitor the experiment against control samples here on earth; both in Houston, Texas at the NanoRacks’ facility and more familiarly, in Warehouse 3 at Ardbeg Distillery. Hamish Torrie for Ardbeg commented “Each year we have brought out a limited edition of Ardbeg as a supplement to our core range – and although Ardbeg Galileo in no way resembles the actual experiment going on in space nevertheless we thought it would be a appropriate to celebrate the experiment, and our partnership with NanoRacks in Houston, with a whisky which Bill and the team on Islay laid down way back in 1999 shortly after we bought Ardbeg Distillery. There are only a few thousand cases available and as ever with Ardbeg we expect demand to be brisk. Nose: At full strength, soot/tar, spicy toffee, butter-kist popcorn with hints of ripe, exotic tropical fruits (banana, mango and lychee). A splash of water releases fresh, salving antiseptic notes and a hint of sea spray. Taste: The chewy/oily texture leads in to sweet, creamy fudge, smoked apricots smothered in cream, ripe banana and lots of spices – cinnamon, cloves and aniseed. Finish: The smoky, but sweet, finish lingers long in the mouth, again drawing the mind back to rich, smoked fruits. I recently panel tested this on the in-laws from Taiwan. In a taste test with this Ardbeg, Bowmore legend and a Laddie Ten the Laddie was declared victorious, the Bowmore more suited to older people and the Ardbeg was described as inducing memories of hospital. Take from that what you will. I preferred the Laddie, though it was a little less smooth than the Ardbeg to give it it’s fair dues. Another useful tip tip from WhiskyTimes: early sixties Taiwanese people prefer Laddie ten to Ardbeg Galileo because it reminds them less of hospital!